You are not signing up as many users as you potentially could. It’s simple as that. There’s more out there for you to improve your results. We spend a lot of time designing and tweaking landing pages in order to get a high conversion. The internet is full of examples of high converting landing pages. Yet, for most companies, it’s hard to realize what you really need to do to get more leads, signups, and conversions. Every pillar has about a dozen different useful techniques in order to improve within that field, allowing you to optimize your landing pages and reach new heights to your conversions. I took the opportunity to also add extra links where you can read more and to share some tools with you to help you improve within that element on your landing page. If you have any questions, feel free to reach out to frank@cronsulting.com or use the chatbox on this website – I enjoy Conversion Rate Optimization and love to help you (it’s free, too, you don’t even have to do business with us). Speed is one of the most essential elements of your landing page. There’s a reason it is added as one of the four pillars. There is a lot of data available when it comes to page speed. When we look at e-commerce websites, we can see a huge difference in page load time and conversion. For example, Amazon loses about $1.6 billion a year if their pages would load 1 second slower. There’s also a lot of data available for page speed on other pages. This article describes that bounce rates go up by 50% if the loading time takes more than 2 seconds. It also states that conversions drop 12% for every extra second it takes the page to load. So, page speed is important. But just the speed itself (how quickly people can find information and submit a form) is a highly important factor as well. Today we have more data on companies than ever before. One of the companies that use this data really well is Clearbit. It has a giant database on tons of companies. And we can use this data to enrich the people that sign up on our landing pages. Using Clearbit’s Data Enrichment’s API, you can get data based on someone’s email address or company name. This is highly valuable when it comes to getting more data from this user. But you can also use this Clearbit data to already enrich some data so the user doesn’t have to enter this anymore. By using API calls on your signup page, it’s very easy to enrich someone’s profile with a ton of data. Clearbit currently provides access to its API starting at $99 for 2,500 calls per month. Which is a great investment as it surely speeds up the registration process for your new customers. Now, do note that in order to get the best out of the company data, people should sign up with their company email address rather than their Gmail or Hotmail address. This gives you a better insight into their company data and allows you to fill several fields. Also, note that it’s good to mention that you’re using Clearbit to get this data. A new signup might be extremely surprised you already have a lot of data on them and this might be bad for signup rates as privacy is becoming more and more important these days. Drift is great at providing transparency when it comes to loading this information. After you sign up on their landing page, you are taken to a new page that mentions that they are using Clearbit to get more data on your company. Errors were described earlier in this article but I believe they deserve another honorable mention. Because error messages can truly make or break your page. And breaking your page hurts conversion rates. When users are filling in a form but do not fill a text field with the right information, it’s best to let them know right away rather than when they click ‘submit’ or after a page refresh. This allows them to fix their information quicker, which helps the overall onboarding experience. It doesn’t matter if you sell software or mortgages, providing a good user flow is important in every single market. We see this form of signing up more and more and it’s one of the best and user-friendly ways to optimize your landing page. Personally, I enjoy singing up with Google rather than having to fill out all the required fields. It speeds up the process and helps me save time (and have more time to write content). 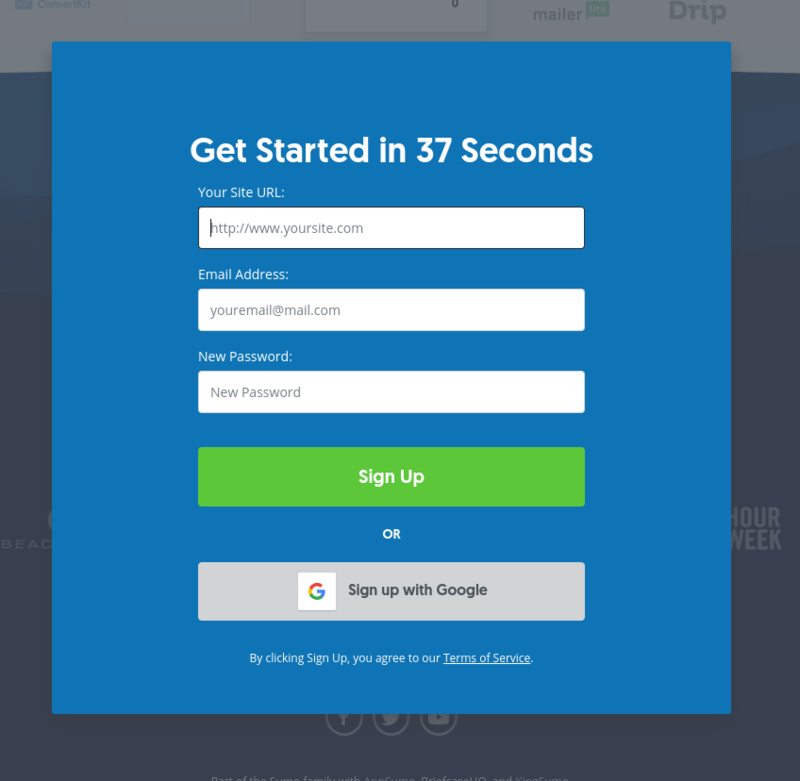 These social sign-ups are found on a ton of landing pages right now and there’s a huge reason behind it. It really speeds up the process of signing up for a product or service, which means the user is happier (and so are you, because you get new sign ups). Now, it’s important to work with these social sign ups carefully. One of the major factors you need to keep an eye on is the information you’re requesting when people sign up using social signup. Google, Facebook, and Twitter now allow you to easily sign up using their platform. And more and more other platforms are following this new standard. These companies have a lot of data on their users and using the social sign up allows you to get this data. But you should never ask for more data than you really need from these customers. Sure, it’s great if you can get as much data on your new users as you possibly can. But this is definitely hurting your conversion rates if you’re not doing it properly. Rather than trying to get all the data, just get the data you really need. Email address, first name and last name, company info and maybe a bit more. But keep it to that. People aren’t going to allow you to access their contacts simply because you’re asking for it. For me, it’s always a turn off when a tool asks me to access my contacts when it has nothing to do with my contacts (and I bet I’m not the only one). So, always make sure you’re keeping the user in mind. This is better for the user but also better for your overall conversion rate. It may seem like a great short-term win to get access to their contacts but if you then spam these contacts you’re losing the one user you had in the first place. Now let’s talk about page speed: as mentioned in the intro of this pillar, page speed can have a huge impact on your overall signup rates. So it’s important to keep a good eye on it. Research has shown that for every extra second it takes to load your page, the conversion rate will drop by 12% on average (now, that’s a ton of signups!). First, there’s Google’s Page Insights. This is a great tool to figure out the loading speeds on both desktop and mobile. It also gives you some advice on what to optimize on the landing page. Here’s an example of Dropbox.com and their load speed. As you can see, Google tells you that there are multiple elements you can optimize. Now, this is all great but in the end, you also want to know what the loading order is. And that’s where the next tool comes in. 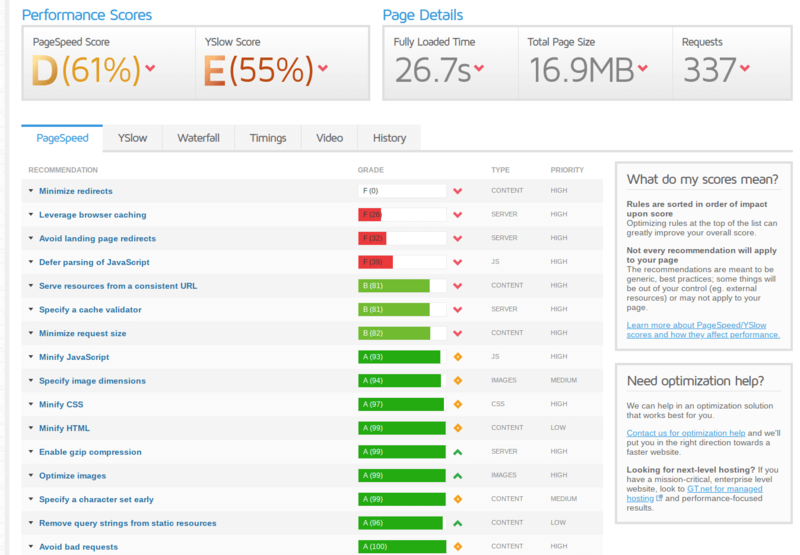 Using Pingdom, it is a lot easier to see where your page can be optimized. It shows you the speed test but also lets you know in which order the page gets loaded. This allows you to get a good insight into the types of elements that can be optimized right now. And the more elements you optimize, the faster your page will load. It’s important to understand that you want to optimize the elements above the fold first and foremost. For example, there’s no reason to already load an image that’s in the footer when the images in the header haven’t loaded yet. 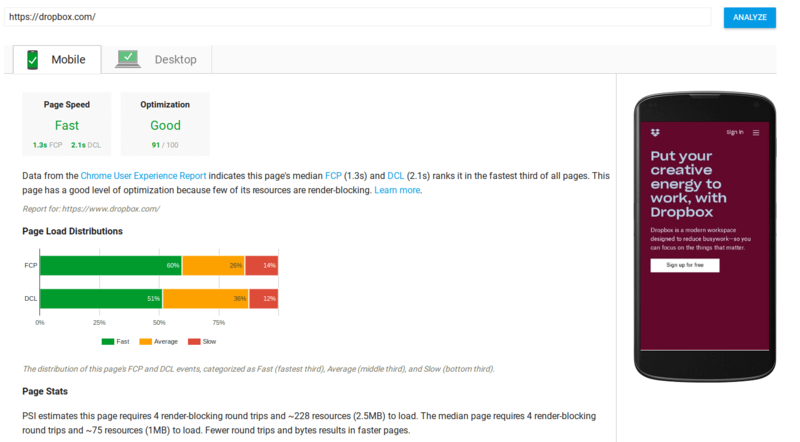 Using Pingdom’s overall loading time overview, you can easily optimize the elements that take the most time to load. It also tells you about waiting time, helps you find elements that may be taking up a lot of time to load and slows down the loading time of other elements on your page. GTMetrix is a bit better than Pingdom in my opinion. When it’s loading the different elements on the page, it also shows you the codes like 301, 404 and others which help you to optimize this website. This helps you figure out if there are endless loops on the page that are currently hurting the loading time. Aside from that, GTMetrix pretty much gives you the same insights as Pingdom’s Page Speed Test. When it comes to hosting, you can do a lot of things right and a lot of things wrong. It’s important to have great hosting since they affect loading speeds like no other. Now, there’s nothing wrong with your hosting package being shared if you don’t have much traffic. But once you reach a specific amount of traffic each month, it’s better to go for a VPS or to have your own server. Cloud hosting is a great solution for companies that operate worldwide as this helps you decrease loading times all around the world. By using cloud hosting, your website has lower loading times on pretty much any continent. Nowadays there are a ton of cloud hosting solutions. One of the most famous ones is still CloudFlare. It uploads your website to several servers around the world allowing you to really speed up the website on any continent. 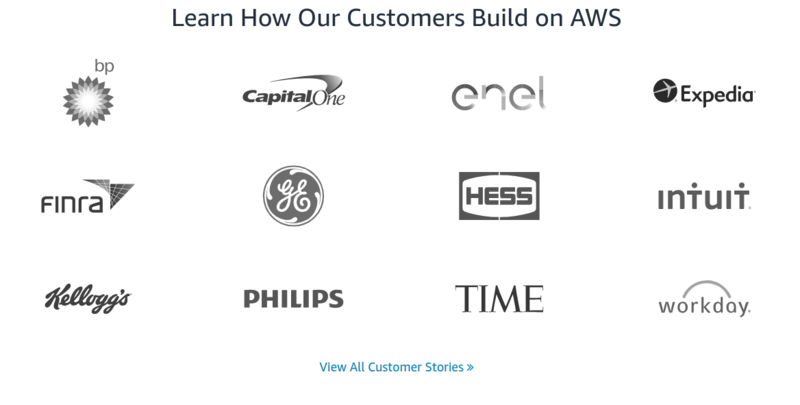 Another great example of cloud hosting is Amazon AWS for Websites. This solution provides access to your website on several servers, where you pay for every server that you want to use for your landing page or website. Now, you don’t have to put your entire website on cloud hosting. Things like the About Us-page aren’t going to be visited thousands of times a day. But landing pages are highly important for your business so you should definitely use a solution like this to decrease the loading times. Alright, so images take up a lot of data and definitely increase the amount of time it takes for your website to load. Which is why it’s extremely important to take care of the images that you are loading on your landing page. I will explain both of these below. So, let’s say you have this beautiful 1920×1200 image and you add it to the landing page. Then, when you actually add it, you change the height and width of the image to 25% each. It looks better like this and you are set up for faster loading times, right? Wrong! Because every time a user now loads your web page, the original size of the image will load. Which is really slowing down when a visitor is loading your landing page. Instead, you need to resize the image to make sure the smaller size of the image gets loaded. This is highly important for your page speed. Using tools like PicResize or Photoshop, you can easily change the dimensions of the image without losing the quality of the image. And this definitely decreases the amount of MB or KB of the image, improving the loading time on the page. But it doesn’t stop there. You can also compress your images making them load even faster. Most images can decrease 70% in size, so for every 100KB you are currently loading, you will soon only load 30KB. This has a huge impact on your overall loading times and should be done any time you are adding an image to your landing page. 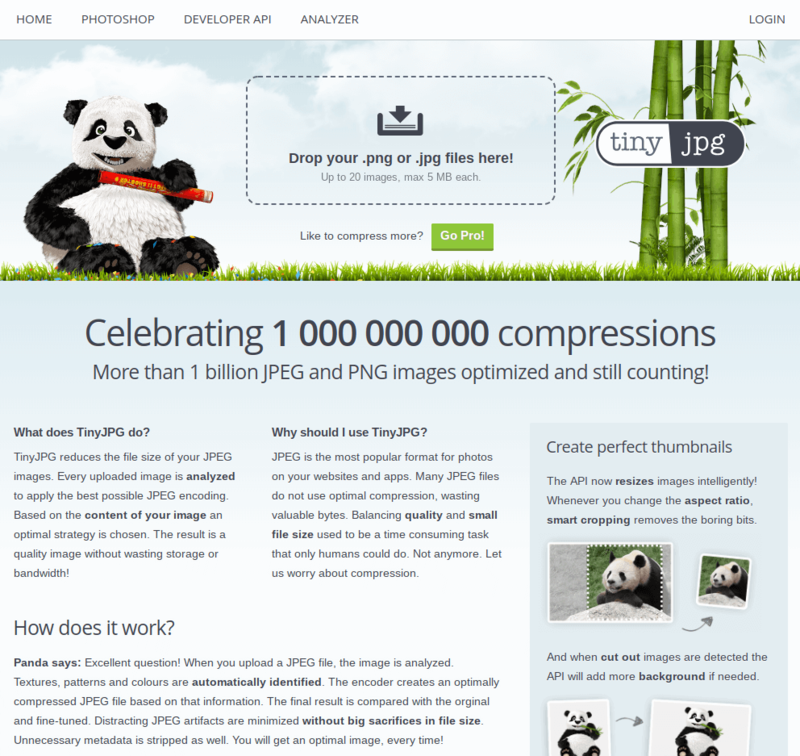 You can easily compress your images using Photoshop or use an online solution such as TinyJPG. A lot of scripts that are currently running in the background of your landing page don’t have to be loaded instantly. You might think they need to but it’s actually great for your conversion rate if they don’t (and you even save money). Let’s say you run a ton of different retargeting scripts for Facebook, Google, and other platforms. By adding these scripts to your website, you are increasing the overall loading time of the web page. And then there are a ton of scripts that may seem necessary (like specific plugins) but are really slowing down your overall loading time as well. In this case, it’s important to first just look at the scripts that are taking a lot of time to load (by using the Page Speed tools). When you have identified which scripts are taking a lot of time to load, you have three choices: keep them and risk conversions, delete them entirely and lose data, or keep them but load them later. See, scripts, like retargeting pixels, can easily be loaded later when you realize that most visitors that leave your site right away are probably not going to be your customers. So if your Facebook retargeting pixel loads in the first 3 seconds on the page, you are also going to show ads to people that clicked it away within 3 seconds (and that doesn’t really make sense, since they don’t seem that interested because they closed the tab). So, these scripts might instantly load now but you can add them lower into the hierarchy of your website. They don’t need to be in the header anymore, you can also add them at the end of the body since it doesn’t matter they are activated instantly. You can even use Google Tag Manager to do this for you (though this might bring some longer loading times for scripts you want to load on your page right away, so be careful with this). There’s a lot of information on how to activate these scripts later, so I added a bunch of these to the additional sources below. A great way to speed up the landing page for returning visitors is by using cache. This allows you to store HTTP requests on your visitor’s computer temporarily, in order to load these elements faster next time. So a visitor comes to your website today and the cache is activated. The loading time is now at 100%. But when they return next week, the loading time will be less than 100% since some elements are already preloaded in their browser. Now, not everybody has caching activated on their browser but a lot of people do. Which is why it’s worth it to add caching to your website. If people are interested in your product or service but don’t sign up right away, it’s best to give them a better experience once they return. As you can imagine, this is especially important when you are running retargeting ads on your landing pages since these users are more likely to return to that specific page. Caching can make a huge difference in the page loading time and your conversion rate. Google has launched AMP to decrease the average loading time for websites. If you Googled anything related to blog posts in the last few years, odds are you have been loading a page that was optimized using AMP. AMP stands for Accelerated Mobile Pages. The website is already preloaded which means Google can load it a lot faster than your own server. When using AMP, Google will save the page on its internal servers rather than on your own server. This allows them to load the pages faster when people are trying to reach them through Google’s Adwords ads or Google’s organic search results. This is essential when you run Google Adwords ads or get a lot of visitors on your landing page through organic search queries. How Google AMP (Mobile Pages) Work to Optimise Conversion Rates? Mobile is getting increasingly more popular, even when it comes to visitors on your landing page. Which is why it is important to optimize the experience for mobile users as well. Today pretty much every company also has a responsive version of their landing pages. You add some code to change the dimensions on different screens and you’re all good, right? Not really. Because you’re not being the best friend to your mobile users that you could be. Instead, you’re giving them a terrible experience. Let’s say you load a screen-filling 1920×1200 image on your regular landing page on desktops. By adding some CSS code to make the page responsive, you’re not actually optimizing these images for your mobile users. Instead, they need to load the same images. But most people nowadays are not on WiFi all the time. So you’re using a lot of their data in order to load these elements. Along with that, you’re increasing your landing page loading time on mobile. It’s better to make new images for your mobile users using smaller dimensions in order to decrease their size. This allows you to speed up the landing page and create a better overall experience for your mobile users. By using lazy load, you can improve the speed of your landing page significantly. You do have to be careful with lazy load, as some plugins and scripts take so long to load an image that you can really ruin the overall experience on your landing page. Lazy Load is a technique where you load the image when the user is near that image rather than right away. This means that images that are lower on the page will be loaded later than images that are in the header. This is especially useful when you are using high-quality images on your landing page that are halfway on the page or even lower. Users now do not have to load these images right away but will see them once they reach that part of the page. A great example of this is Crazyegg. They don’t load images unless you are close to it. Now, I don’t necessarily recommend doing this to all your images, but definitely try doing this to images that are lower on the page. You can even add a ‘Slide in’ CSS script to the page making your landing page look more professional. Because images take a few milliseconds to load through Lazy Load, this doesn’t really bother the overall user experience too much. In the end, it’s all about finding that sweet spot with Lazy Load. Images taking too long to load will decrease overall conversion rates but so does creating a website with a ton of images that take a long time to load. Elements that are loaded lower on the page can be added to the overall HTML code below the important elements. This allows you to significantly boost the user experience. Let’s say you want to add a Live Chat module to your website to answer visitors’ questions (as you’ve read in another section, this is a great idea!). You don’t necessarily want this Live Chat to load instantly – nobody is going to click it in the first 0.5 seconds. So, you add the script for the Live Chat further down the page, allowing other elements that are more important to load first. Everything that is ‘above the fold’ (the first elements people should see when they load your website) should be high up in the code of your website. Since people usually don’t scroll all the way down right away, the other elements can load later. Videos that explain how your product or service works are great for conversions. You simply give someone a brief explanation in a 30 second or 2-minute video. It’s a lot easier than reading the whole landing page plus you can show them a lot more. But, do not underestimate how big the impact is on these videos when it comes to the loading time of your landing page. Videos are big, very big, and they can really slow down your landing page. One of the most important aspects of adding video to your landing page is to pay close attention to what it does to the overall loading time. You have to follow a very important rule here: do not autoload videos. Autoloading videos means the video will be loaded right away as soon as someone visits the page. This still happens on a lot of landing pages and it’s lowering the conversion rate. Along with that, never instantly load the whole video. There’s a big reason YouTube stopped loading the entire video years ago. It takes a lot of data, not just on your end but also on the users’ end. Instead, make sure the video gets loaded in bits rather than all at once. This will really speed up the page. You should also look into solutions that help you speed up the video loading time. If you upload it to your own website, the video usually loads all at once and will take some time to load. Again, this is bad for your conversion rate. There are several platforms where you can upload your videos. Vidyard is a great example of this as they allow you to analyze the video data to see where people stop watching. You can then go back and improve your video. One more section on the external scripts you are loading. When it comes to landing pages that are built in a CMS, for example, a lot of extra scripts get loaded which aren’t necessary. A good example of this is using WordPress plugins on your landing page. Let’s say you optimize a landing page for PPC but also have a bunch of SEO plugins installed. These plugins will also load on your PPC landing page, increasing the page loading time. So, it’s always important to keep an eye on the different external scripts that you are loading. There’s nothing wrong with using external tools such as live chat, Hotjar, Kissmetrics and similar tools but the more external scripts you use, the higher the page loading time will be. Using tools like Pingdom and GMetrix you can easily see which scripts take a lot of time to load and can decide whether you will still run them on this landing page. It’s important to go back to the external scripts once in a while to check on this since they can take up a big portion of your loading times. Adding new analytics tools to your website is necessary to get great insights on what to improve on your page but if they add an extra second to your loading time you are already losing 12% on your conversion rate – definitely not worth it. To be fair, most of these companies invest a lot of money and time to make sure the script loads as quickly as possible. With big companies, you can thereby usually not go wrong with adding these scripts. But if you’re about to use a new analytics solution, you might not want to do that on your best performing landing page. Trust is a huge factor when it comes to conversion rates. There are about a dozen elements that you can use on your landing pages that will increase people’s trust in your product, service, brand and company. Below, you will find the most important elements to use on your landing page. One of the biggest factors to increase trust to get new users on board is by offering them a free trial. Now, for most businesses, a free trial is nothing new. You offer a 7, 14 or 30-day free trial to get new users to sign up. Or, in some cases, a freemium model is added to the business model to get new users on track. Once they need the pro features, they will obviously upgrade. When it comes to free trials, it’s important to realize what to ask. A lot of companies ask for credit card information when a new user signs up. This has significant advantages when it comes to your signups. For example, if they finish their trial, you are sure you can already bill them starting on day 1 of their paid subscription. On the other hand, requiring credit card information may actually hurt your business. If new users truly love your software and they can’t live without it, they will obviously upgrade when the free trial ends. On top of that, you may get some emails asking for refunds (or they cancel the transaction through their bank) because they didn’t plan on paying. A high number of refunds will hurt your business in the long run (it requires more support and may have an influence on your reputation with your payment provider). After all, you mainly want new users that will be clients for a long time. As a business, you should aim to go for the highest Lifetime Value. This means you should convert free users to paying users only when they are going to use the software after the trial. You increase your trust by giving new users the ability to use your product for free. This is either a short free trial or a freemium package. 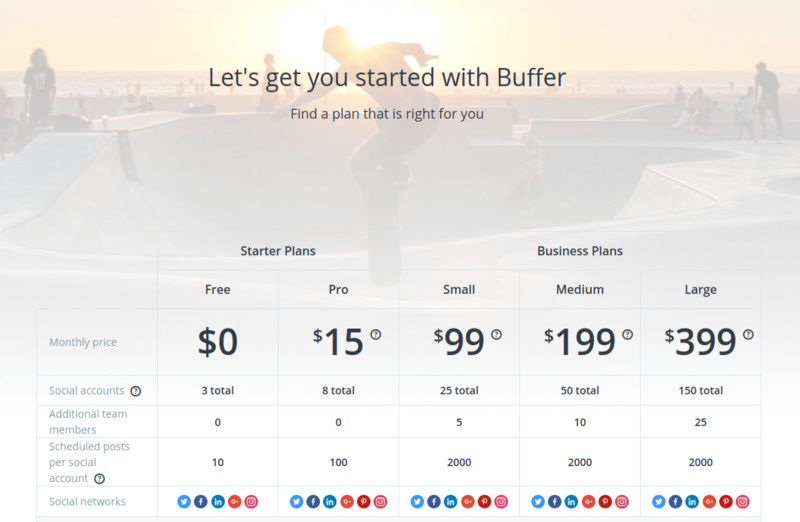 For example, Buffer added a freemium package to their software in order to get more users. These users have limited features. Once they reach their limit, there’s a higher chance they will convert into paying users. Buffer currently has over 80,000 paying customers and over 300,000 free users. Odds are a lot of these companies started out with a freemium model (or a free trial to their pro packages) and then converted users into paying customers. 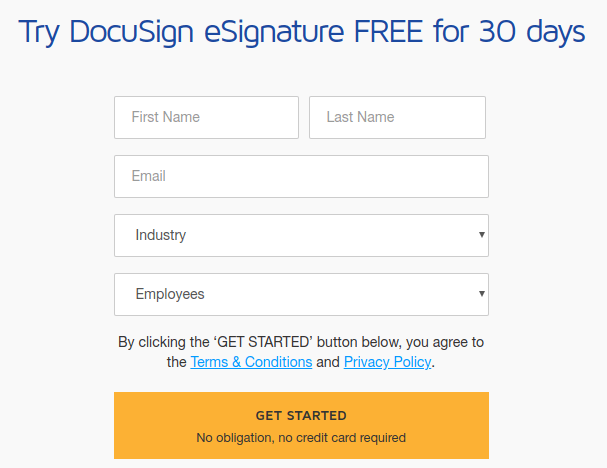 Another example is DocuSign. They even tell you on the signup page that you don’t have to add your credit card when you sign up for their software. Now, it’s really up to you whether you require credit card information when a new user signs up. But do understand the pros and cons, and consider what works best for your business. Chargebee has written a great article on when you should and shouldn’t require credit card information when users sign up. As the article states, companies that are looking for a high revenue per user and fewer conversions, should ask for a credit card during the free trial. This allows you to only get users that are highly interested in the product. But, on the other end, this will scare visitors that might not be fully sure whether they want to sign up. It’s like having to give up your payment details in order to watch a movie trailer. It’s smart to test this in order to see what the best outcome will be for your own business. Just know that trust is important on your landing pages and when you ask people to commit to you with their personal details, it’s important to build towards a high trust environment. Freemium vs. Premium: which is best for your SaaS company? “Reviews make the world go round”. If there’s anything that helps people make a decision, it’s social proof. If my neighbor loves something, and I like my neighbor, odds are I will also love a product he has bought. If you go out fishing with your buddy on the weekend and he bought new bait which he believes is the best bait ever, odds are you will order it once you get home. The nice thing about reviews is that they’re easy to get plus they’re a great help to get new customers. Aside from that, in line with this chapter, they also build trust. And they build trust in a great way. Now, reviews come in many different ways: testimonials, star reviews, influencer reviews, review videos, media coverage, and a lot more. These different types of reviews will be explained below in this article. Right now, we’ll look at external reviews, which are reviews on external websites. Websites like Capterra and G2Crowd help you collect more reviews from customers. They are an easy to use solution to get some great reviews on websites that others may stumble upon when making a decision. Now, these reviews are external. But these websites offer a simple widget to display your review score on your own landing page. Users will trust your website more if there are a ton of reviews for your product on neutral websites and you have a great score on those websites. Getting a great score isn’t hard if you have a good product and provide great service. By displaying the review scores on your own website, you provide a bigger element of trust and make sure that your new potential signups will convert quicker. Aside from that, you can also send them a link after they signed up, leading them to these review pages. Along with reviews of your product, it’s important to add testimonials to your landing pages. Testimonials describe a customer’s experience with your product and outline why it has helped them. There are many ways to add testimonials to your landing page. Lately, there seems to be a huge trend in video testimonials and using them for ads on YouTube and similar platforms. On your landing page, it’s best to just limit it to regularly written testimonials. They are easy to digest for your audience and can significantly help you boost your overall conversion rates if they are used right. In the example below, you see a screenshot of SalesFlare, a new CRM (Customer Relationship Management) business for sales that automates most of the process for salespeople. As you can see, they use the testimonials in a great way. They not only show the testimonial with an image of the user and their company but they also chose 2 fantastic reviews. Working with a CRM is not always a great experience. It takes up a lot of time and it can be quite boring. By using these testimonials, they show users can save a significant amount of time when using SalesFlare. Using a picture of your user or a company logo is highly necessary for your testimonials. It’s easier for people to trust you when using images. They realize these testimonials are real, which builds a good amount of trust. Another company that does this really well is Drift.com. They use a single testimonial, including the picture and company name, in order to showcase how customers use their product and what kind of benefits it gives them. So, testimonials are definitely something you should add to your landing page. It’s key to make sure the testimonials outline how your product or service has made your users’ life easier. Case studies are a great way to showcase how users are currently using your service. It is a highly important factor for your landing page as it gives new visitors an overview of what they can expect from your product or service. 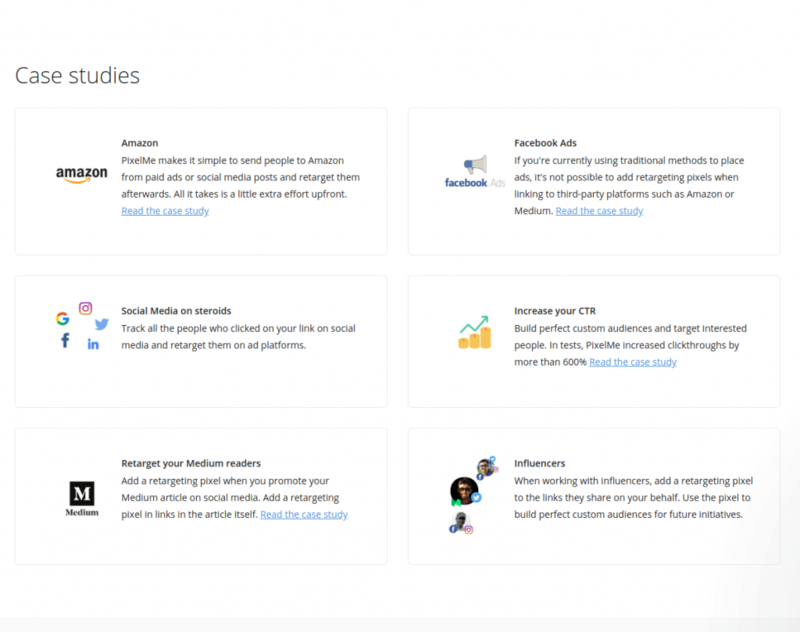 By using case studies, you outline the experience of a user on your platform. Case studies can be about the results someone has gotten from using your product or service (like 20% more productive, saving 25% on their monthly expenses or anything similar). But they can also be about unique ways of using your product. By creating great case studies, you help visitors to understand what they can expect from your product or service. By setting these expectations, it will be easier for them to understand what the benefit of using your product or service will be. They can also learn new ways on how to use your product or service, allowing them to take steps into new ventures. A company that does this really well is Amazon AWS. Of course, Amazon AWS is a huge company (they own 33% of the cloud infrastructure market) and it mainly has to do with the fact that they know how to optimize their landing pages. These case studies are focused on the different ways companies have used their product in order to grow. Every company wants to grow and to improve their online infrastructure and Amazon does a great job showcasing exactly that. Another great example of this is Pixelme. They showcase a variety of ways people can use their tool in order to grow their audience. By giving people a sense of how to use this tool, it is easier for them to decide whether it is a good solution for them. Case studies also ensure that you get the right signups and free trial users. If a user doesn’t recognize that the ways the tool is used in the case study is valuable for them, they might not sign up. You might think “but someone not signing up is definitely hurting my business”. But remember, it’s not about getting as many conversions as you possibly can, it’s about converting the visitors that will stick with you for a long time and have a high Lifetime Value. If your product or service has a ton of different use cases, it’s important to have a variety of case studies. By having multiple case studies, you give your visitors a better understanding of the different ways they can use your product or service. If you have ever visited more than 10 landing pages, you will have seen this element come by at least 3 or 4 times. A lot of landing pages are optimized to the core, and one of the ways to build trust is by showing new visitors that they are in great company. Client logos are a great example of using a small element on the page to get a high result from it. It’s not strange that so many different companies use this element on their landing page. Invision is a great example of this. They showcase a few big companies that are already using their tools. By showing these companies, it is easier to convince other big companies to join their platform. Not just that, it also allows them to attract smaller users. If the big guys are already using Invision, you can’t stay behind and not use it yourself. Having great brands as your client is a sure way of attracting new users and it’s a great conversion booster for your landing page. Another company that does a great job including the client logos is Viral Loops. By adding logos that their future customers might know, they allow current visitors to get a better understanding of which companies use their tool. Always make sure your clients are okay with you adding their logos to your website, this is always a good show of faith when it comes to the relationship with the customer. During your launch and while operating for several years, you will be picked up by several journalists and platforms that have a high penetration within your market. It’s smart to mention which media platforms have written about you. This allows your users to see that some big names have talked about you. It will lead to a higher conversion rate as these established names are acknowledging that you are a great solution. So by being published on big media platforms, you not only reach their readership but also allow your future visitors to see you as trustworthy. If Forbes or the New York Times has written about you, it means your product or service is highly valuable. One of the companies that are great at doing this is Quuu. When you go to their website, the media mentions are placed ‘above the fold’ (the part of the page that you instantly see without scrolling). By mentioning well-known media platforms, they give their visitors a better understanding of their reputation, which will ultimately lead to better results for your conversion rate. Big platforms like Forbes and Inc. have already written about them. Since these are names anybody recognizes, it’s not hard to figure that this element indeed increases the conversion rate. 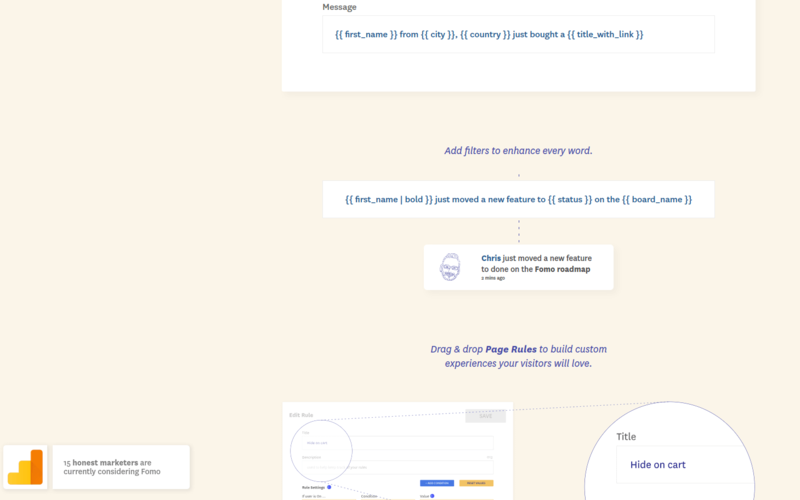 Another landing page that fulfills this element really well is Mailshake’s homepage. Their landing page mentions well-known media platforms such as The Huffington Post and Entrepreneur.com. They add an extra boost to it by mentioning TheNextWeb and Hubspot, two well-known sources in their target audience’s market. It may seem hard to be mentioned or even published by these media platforms. But if you have a great product, it’s not actually that hard. Along with that, you can even publish your own content on these websites. For example, last year I got one of my articles, 12 Ways Your Landing Page is Making You Lose Potential Customers on The Next Web. I have added some sources below this paragraph that will help you get started. Alright, so this may seem like a no-brainer. Yet, I still see companies that have no phone number on their landing page. Most of the companies who do not show their phone number just don’t want anyone to call them. But mentioning your phone number isn’t about getting calls all day. It’s about just showing people that you are an actual company and that they can reach you by phone if they need to. Or, worse, you might get spammed by cold calls all day because people are trying to sell you their new product. Sure, I understand you don’t want to answer customers or sales calls all day by phone when email or live chat are better solutions. But in the end, you will increase the trust on your landing pages and thereby increase the conversion rate on those pages as well. It’s one of the easiest changes you can make to your pages. Even if you do sometimes get the occasional sales call or customer question, it is still worth it to add it to the page. Live chat is amazing when it comes to increasing your conversion rate. Just like with adding a phone number, it is there to answer your visitors’ questions. If people do not immediately understand what your product or service can or cannot do, they might have some questions. Sometimes these questions aren’t immediately answered on your landing page or in the FAQ somewhere else on your website. Which is why it’s important to help these customers with their last minute questions. If you’re about to sign up for a product or service and still have a few questions, you’d rather have an immediate answer rather than having to look for an email address or fill in a contact form. Live chat is a great solution that started just a few years ago, but many companies already see a huge spike in conversions because they offer the live chat option. And just like a phone number, it shows that you are an actual company with actual people. People love people. So by adding live chat, you can immediately show that you are not some anonymous business who doesn’t like to talk to their clients. It’s also a great way to give a good first impression. If you already provide great service before someone is even a customer, you’re bound to have more satisfied customers and a higher Lifetime Value. 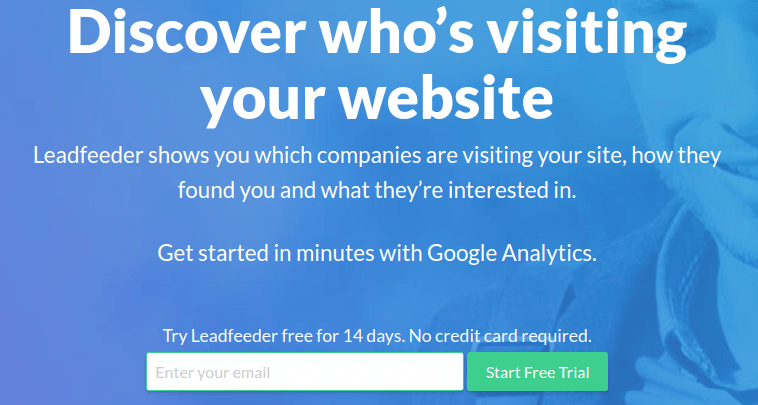 FindThatLead, a software solution that helps you determine which companies visit your website and find important email addresses, offers the live chat option on their landing pages, allowing new visitors to contact them immediately. As you can see, the live chat is currently occupied by 9 different people. It’s a nice welcome for new visitors to see that several people work at their customer service. Another example is SlideBean, a presentation tool that companies use for pitch decks and similar presentations. Since there are a lot of tools that you can use to make presentations, the best way to stand out is to add something that allows you to talk to potential customers immediately. Imagine Microsoft having a live chat for Powerpoint or Google having a live chat for Slides. A perfect way for SlideBean to stand out in their market is to add things like live chat and use it to increase their conversion rate. There are several tools that you can use for live chat. 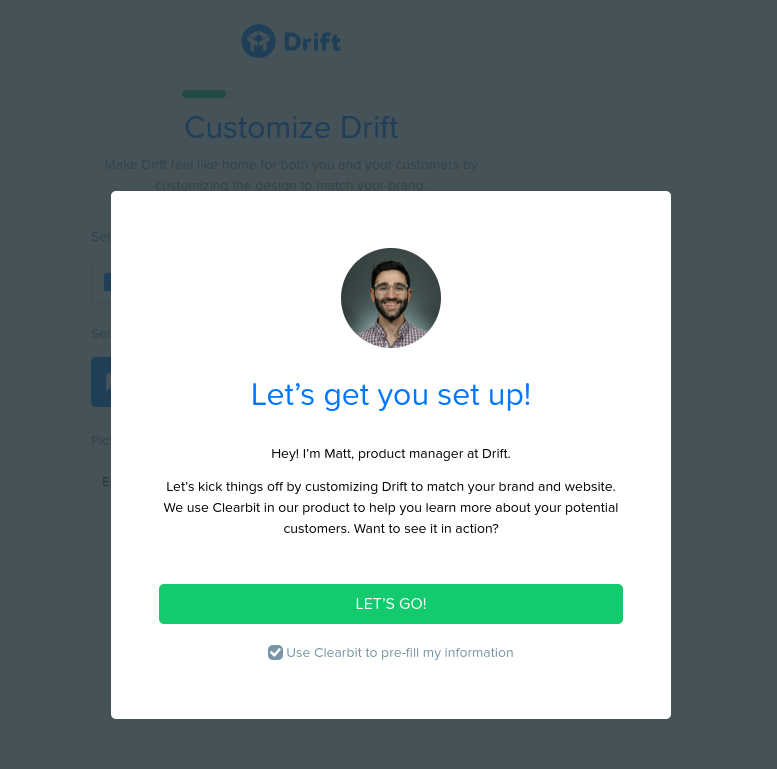 Some famous tools are Drift, Intercom, Tawk.to, LiveChat, ZenDesk and many others. Live chat requires employees to offer live communication. It’s important to provide the best service and to have people that understand the product answering questions. Below I’ve added some resources that explain how to get the most out of live chat. Part of optimizing your landing pages is to answer your customers’ questions. If you keep seeing the same questions pop up, it might be a good idea to answer those questions on your landing page. Blogs and content marketing are great at building more trust from your visitors. By showcasing the content your company has published, they will believe that you truly understand who they are and how your product will help them succeed. If you sell bookkeeping software to your users, it’s a no-brainer to publish content on taxes and related topics. Creating engaging content allows your company to stand out from all the others in your market. This can also be done by adding a button to an article, whitepaper, or anything that you have written. Sure, you don’t want to lead people away from your homepage because they may never return. But the content you publish does increase trust and ensures visitors will trust you. Lots of companies are currently publishing highly valuable content that allows them to stand out. You don’t want to add a huge button on your landing page where people can exit in order to go to your blog or whitepapers. But you do want to at least add a small link to the footer or the header to showcase your expertise. Let’s be real: people are much more likely to buy from you if you have the expertise they are looking for than from companies that showcase nothing. The trust people put in you increases with elements such as the content you publish. There are a ton of companies that publish great content. 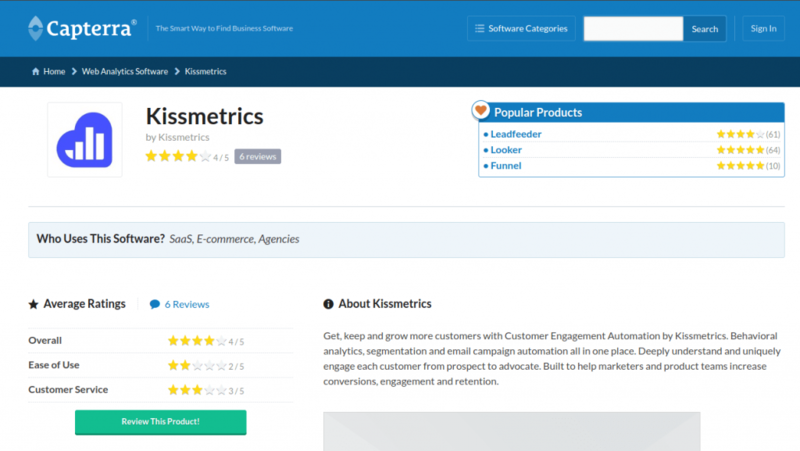 Websites like KissMetrics, Unbounce and Drift publish a ton of content. These content pieces then attract new visitors which then go to the important landing pages. Writing great content works both ways: it attracts new visitors to your website and builds trust with those who visit your landing page. Again, people love people. And they love seeing who they are working with. Now, this doesn’t mean you should literally add all the people that work at your office to your landing pages – this will most likely get incredibly crowded. Instead, try to at least show one employee on the landing page to give your company a trustworthy feeling. Nowadays, it’s actually very easy to add some smiling faces to your page. If you already add elements like a live chat to your page, you will have the opportunity to add some pictures to it. Or let people know who the person is that they will be working with. A broker, for example, should tell you which person within the company you will be in contact with. But in most cases, you’re safe with just adding a live chat to the page and adding some employees with their pictures to it (don’t use the standard grey avatar image though, this just comes off scammy). It’s also a good idea to display some employees on the contact or about page and add a link to the footer of the landing page so that people can check it out. People just want to see that there are actual people in your company and that you’re not trying to hide behind something. On your landing pages, it’s important to segment for the different markets and users that reach the page. Most companies already do this, but sometimes I see a company that just offers a one-size-fits-all solution. Now, there’s nothing wrong with one-size-fits-all solutions if that’s all that your market needs (for example, Dropbox doesn’t have to offer different packages per se). But most other companies should definitely segment their different markets and users in order to get the best signups and users for their product or service. Let’s say you offer software that is useful to both individuals and teams. You don’t want the individual to sign up for the team package because it is not tailored to fit their problem. On top of that, they will have to pay a lot more. Aside from pricing, some people want more features and even want better support. And they’re willing to pay for it. So it always pays off to add specific packages to the pricing page in order to segment these users. For example, SemRush shows different prices and packages for different users and company sizes. The first package is mainly aimed at individuals. The third package is then focused on businesses. By segmenting for different users, you can still get a significant amount of signups while not having to worry about the price being too high. Slack is also a great example of this. They use a different model though. You just pay for every new user that is added to the platform rather than having to pay fixed fees to use Slack in your organization. It’s usually easy to identify the different types of audiences, especially based on where they are coming from. If you run paid ad campaigns, you can already segment before the visitors even reach your landing page. Showing different packages for different users shows that you understand the user. A better understanding helps you build more trust, which ultimately leads to a better conversion. There’s no better way of showing how your value is perceived in the market and how well your company is doing than showing industry acknowledgments. Not only do they help you showcase your company, but they also build more trust when visitors see these acknowledgments. Now, that small trophy you’ve won in 5th grade for being the fastest runner in your school is not going to be sufficient in this case. You’ll need some great acknowledgments that will actually help visitors get a better view of your company. Most industries don’t have many industry awards, so sometimes it’s hard to acquire something like this for your company. But if you end up winning a fantastic award (best company on GlassDoor in your industry, for example) it is always worth it to showcase it on your landing page. Fomo is a great tool to add social proof and trust to your website. The tool has different solutions that help you create a better insight in how other people are using your website. One of the ways you can use this tool is by showing users that other users just signed up, bought a specific package, upgraded their account or anything similar. By showing this social proof, you are building more trust towards your new users. After all, you are showing them that other users have already trusted you in the past week, day or hour. Outreech is an easy to use tool to showcase reviews on your website. Every company gets reviews and it’s good to show them right on oyur website. 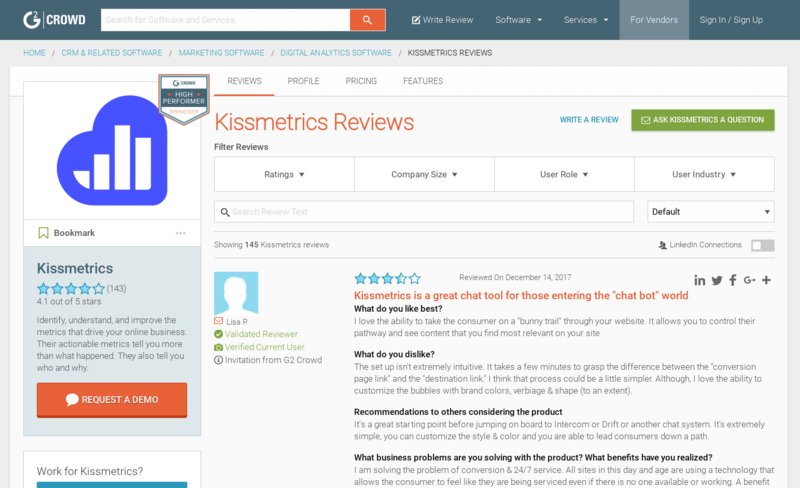 Using star ratings and actual written reviews, you can easily embed the testimonials your customers are giving you. You want to give every landing page a clear sense of focus. You obviously want someone to complete a specific task when they visit the landing page. This is why it’s important to remove distractions from the landing page – remove anything that doesn’t really need to be there or doesn’t at least improve the trust, clarity or usability of the page. Not only will this help speed up the page, it also allows you to ensure fewer people leave the landing page before completing the action. For example, do your visitors really need to know you recently hired another salesperson for your business? Things like these, or any other company news, shouldn’t really have to be on a landing page unless it truly matters. Things like job openings and such also shouldn’t be on the landing page. 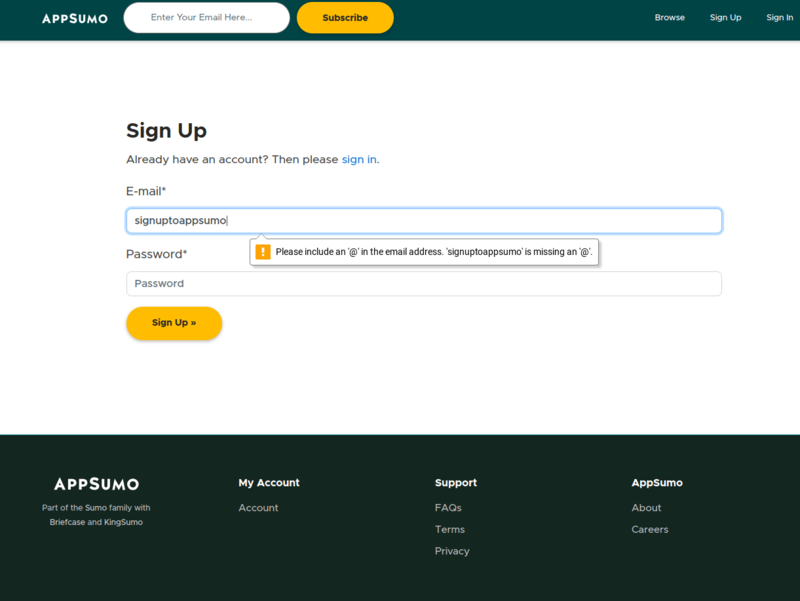 You simply want to give the user a perfect flow when they sign up for the product. This part cannot be emphasized enough. Distractions truly kill conversions and can ultimately lead to having a way lower conversion rate than your landing page truly deserves. Let’s look at this homepage of WordStream. Obviously, they try everything on the homepage to make sure you are going to trust the company. They provide a lot of clarity and it helps them stick out from other similar solutions. But you don’t see unnecessary elements such as Facebook Share buttons, Twitter buttons or anything else. Everything is designed so people will see the clear orange button and will then take action based on this element. So this is pretty much conversion optimization 101 but I believe it’s important to at least cover it in this article. Buttons should be visible and clear at all times. Sometimes I still stumble upon a website that doesn’t have a visible call-to-action button. Yet the amount of signups and conversions you will have in the future is highly dependent on making this element visible on the page. Not just that, you should also use the right wording on the buttons in order to increase the signups and conversions. More and more companies are doing it right and that’s great to see. You need to make it clear what people can expect after they click a specific button. Where will it lead them? What is going to happen? Using persuasive wording in your buttons is highly important as well. Are people signing up? Use “Sign up now” (yes it’s that easy). Are they requesting a demo? “Request a demo” are the words you want to use for this. Yet some companies still use words like “Next >” or similar wording. That’s not giving a clear indication of where people are going. The message is unclear and will definitely hurt your conversion rates. By using clear wording, you set yourself up for a higher conversion rate instantly. And by doing so, you allow yourself to open the floodgates to faster growth for your company. A third element on the call-to-action is to make sure it is clear, and that there are no big distractions around it that do not lead to a higher chance of clicking the button. Clarity is highly important and a clean design really helps. By making the call-to-action stand out (no distracting images behind it) you get a higher conversion rate. This is highly important for your conversion rate as it really increases the usability of the page. The order in which you design the page is also highly important in order to increase signups and conversions as much as possible. By having a clear outline of the whole page, you set yourself up for higher conversion rates. A good landing page explains the product or service that the potential user is about to buy or sign up for. It talks about the benefits. It acknowledges their problem. It shows trust elements, gives users a clear focus on what to do next and just has a nice feeling to it. There are many different ways in which you can order the different elements on the page. And there’s not really a blueprint for the optimal design. In the end, it’s all about testing how to do it right. But do make sure that you at least start the page with a clear ‘above the fold’ (first screen users see) and a good outline on what users should do. The main benefits and call-to-action should be visible as soon as users load the page. By changing the order of your page, you can easily see how this affects your overall sign up rates. Sometimes the smallest tweaks might lead to huge outcomes simply because you change the page order a bit. This is why it’s highly important to be adaptive to changes on the landing pages. Using tools like Hotjar or CrazyEgg, you can see how far people scroll down on the landing page. You can then make changes accordingly in order to increase the sign-up rate. Usability also comes from knowing how to talk to your visitors. One of the most important aspects is knowing that you can’t use jargon or hard words if your target audience doesn’t speak it. Let’s say you sell software globally. You could write great copy using hard words and make your landing page look as professional as it can be. People in the United Kingdom and the United States will definitely understand what you’re saying but the rest of the world might not. The key to using the right tone of voice on your landing page is to know what to tell visitors, how to convert them and how to not confuse them in any way. A great example is Dropbox. There’s a ton of technical components that make Dropbox the way it is. But it’s not about the technical infrastructure that they’ve built. It’s about the solution that they are providing. Dropbox doesn’t talk about being a perfect cloud solution. It talks about being able to share files with yourself. To make back-ups. To be able to work on files with others by collaborating. It’s not about the technology, it’s about the solution. Knowing this, it’s a lot easier to put more emphasis on creating a great usability experience for your customers. After all, they are the ones you should truly care about – it’s cool that you know all this jargon and know the technical side of the product. But your customers probably don’t care. They do care about what kind of solution you provide them. They don’t care you’re bookkeeping software has the fastest servers ever. They care about being able to save a lot of time on their bookkeeping. Another great example is Better Proposals. 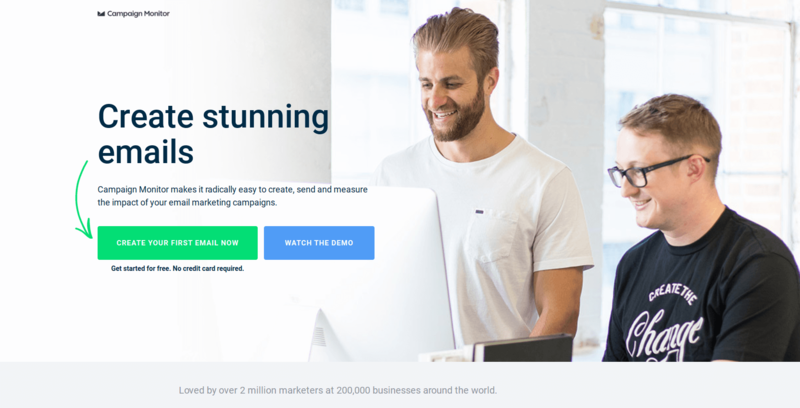 This company creates software that makes it easier to create sales proposals – something most people spend a lot of time on. Using Better Proposals, it now will take you only 30 minutes to create an outstanding proposal. They created a user-friendly environment built on a great technical infrastructure and designed the whole experience as best as they could. But it’s not about these two elements, it’s about the fact people can now quickly make a proposal. By improving the tone of voice on your landing page, you allow users to get a better understanding of the product. And by getting a better understanding of the product, they will find it easier to decide whether it’s a good fit for them. And once they realize it’s a great fit, you make sure you get signups that will actually turn into long-term users. As you know, it’s better to have several sign-ups that turn into long-term users than having a lot of free trial users that never end up paying. Errors – they’re not everyone’s favorite. But sometimes people use information in the signup form that doesn’t get recognized or accepted by your system. And that’s alright. If I mistyped my email address I would love to know and make a quick change. But it’s important to realize how to word it properly in order to increase the usability of your website. It’s terrible to blame the user for not providing the right details – let’s start with that. Never blame your user for making a horrible mistake. ‘You didn’t provide the right email address’ is a terrible way of showing an error. Rather, tell them the system has a hard time recognizing the format of the email address: ‘It looks like our system can’t manage this email address’ or ‘We have a hard time validating this address’. Take the blame on you. Sure, it might be your user’s fault for not providing the right address. But all you have to do is tell them, not blame them. You’re not trying to school them on how to use the internet, you’re just trying to help them get access to your tool. AppSumo does a great job of providing a good way of showing the details entered weren’t correct. By showing an error message like this, they make sure they look friendly to the user. None. Error messages are a great way of giving your users a better experience. Start using them. When a user sends in a form but an error is in the form, this usually means the page will reload. Now, sometimes I still see a landing page where all my information just disappears when I send in a form. So I have to fill in the form all over again. It shows me that I didn’t enter a specific field and now makes me fill out all the fields again. Instead, make sure that the information that users provide will get loaded back into the fields when they send in the form but an error gets shown. Actually, please just stop using reloads when someone fills in a form. Forms should be interactive and should show error messages right away rather than after the page has been reloaded. This saves users time and gives them a better overall experience. It’s no problem that the user has to fill out specific fields because you require them to do so. It’s a standard on any landing page. Just make sure that you show them which fields are required. This doesn’t seem like a huge factor in your conversion rate but it definitely has an impact on the time a user needs to fill in the required information. If age is a required field, show them that age is a required field. If you don’t need to know their age, don’t make it a required field. You’re trying to get the best users, after all. If their age is not going to be used for anything specific, rather just not ask it. If you still like to know, just tell the user you want better insights. Just don’t make it a random field. Required fields are often shown with asterisks (*): ‘Email address*’. This is now an industry standard on the internet. Another way to show a field is required is by just adding ‘(required)’ behind the field name. This is one of the smallest tweaks to your landing page that you can make but has a big impact on the usability of the page. If you never show users which fields are required, they will endlessly refresh the page because they keep getting errors. 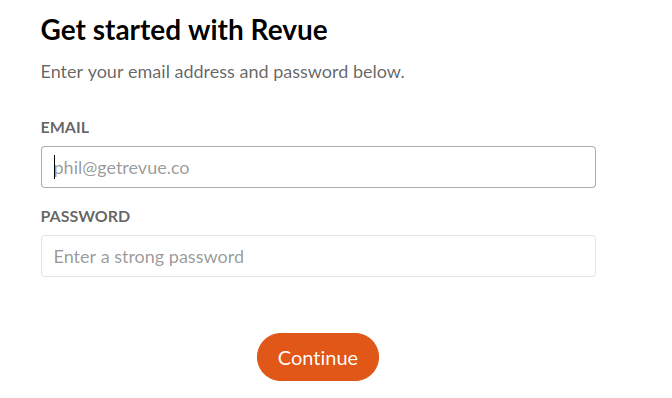 None, just go add ‘required’ or an asterisk to your form field names. Usability in a form is highly important. So make sure the forms are user-friendly as well. If you ask people to provide their phone number, tell them why you need their phone number. Are you going to call them? If so, when are you going to call them? By providing a good reason for asking specific data, you boost the usability in the form and create a better experience for the user. Users aren’t going to provide their phone number just because you’re asking for it. It’s a terrible idea to just randomly ask phone numbers. Are you going to call me randomly? What if I’m sleeping and you call me? With global companies, there’s a huge chance you call me right around the time I would like to be sleeping. If you ask for their company size, tell them why you’re asking for their company size. Is it to give them a better offer? Is it to make sure you have the right solution for them? Or are you asking them just because you want to know? In any case, it’s important to show them why you’d like them to fill in the information. Another great way to add a better usability experience is to just add how long it will take them to fill in their details. Sumo does a great job of providing just a small line of text that has a great impact on their usability. It will take users just 37 seconds to fill in the information that is required to start their free trial. Help your users have a great experience. The internet is full of terrible experiences when it comes to submitting forms. Stand out by just making it easy for them for once, they will have a way better experience! None, just give your users a great experience. Stand out – don’t be like the corporates, don’t make them fill out useless fields. Create a better internet. Alright, so this is pre landing page but I believe it’s highly important to realize that the usability on your landing page has a lot to do with the ads you are currently running. If your ads do not align with the experience on the landing page, you’re going to have a bad time. I often come across ads on Facebook, Twitter, and LinkedIn that redirect me to a page that has nothing to do with the offer that was described in the ad itself. Or equally bad, the ad has the same title and description as the landing page. Ads should be there to attract visitors but if you use the same title and description you give them the same experience twice – there’s no use in that. Definitely make sure the content in the ad aligns with the landing page. But don’t just blatantly copy the ad and the landing page. Here’s how to not do it. 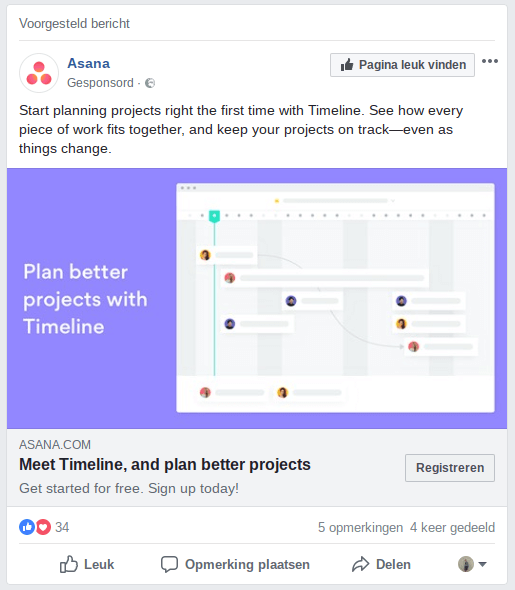 Here’s a screenshot of the Facebook Ad for Asana’s Timeline. Yet, when I visit their home page, I see nothing that talks about the features of the Timeline. So they’re advertising for a specific feature yet don’t tell people about it on their landing page. Make sure that everything you do in your ads corresponds to the experience that users will have once they reach the landing page. It’s the best way to increase conversions. If you’re going to use a pop-up once someone has submitted a field, make it count. Most landing pages automatically redirect you to the right page, such as the tool’s environment where they can start using the tool right away. But if you’re going to use forms where people do not get redirected to another page, use pop-ups or a notification to tell them the form was sent successfully. I have seen landing pages where no message was shown when I entered the required information and clicked submit. So I kept clicking. And clicking. And clicking again. Until I checked my email 5 minutes later, where I had 9 duplicate emails telling me the form was submitted successfully. You want to give your users the best experience when they are using your website and form. So once a form has been submitted successfully, tell them. You don’t want users to sit around waiting and getting bored because they never get a message the form was submitted successfully. If you don’t tell them, odds are they will go to a competitor’s website and check out their offer. You are giving them enough time to find different solutions to their problem and can easily lose customers by doing this. Placeholders are those transparent words that are filled in on a field and disappear when the user starts typing their data. They’re a fantastic way to make sure you are getting the right data from your users. Besides that, they are highly recommended to increase the usability of your website. Here’s an example of Revue, a fantastic tool that helps you create better newsletters quicker. By providing an example of the type of data you would like from your user, you make it easier for them to understand this field and it will be quicker for them to fill out the entire form. Now, when it comes to email address and password this may not seem like something special. But when you’re asking them for very specific data, such as their website, and you want ‘https’ to be included, it’s smart to use a placeholder for that. Note: do not use placeholders as field labels/names as this might hurt conversion. If you do use placeholders in your fields, make sure you are using adaptive placeholders. Using clarity on your website means making everything as transparent as possible. This is essential to making sure that the users you are converting are also going to be lifetime users. Clarity makes your conversions more profitable so it’s good to put time into making sure you are providing as much clarity as you possibly can. There are several elements you can use in order to increase the clarity on your landing pages. Some of these have a very high impact on the conversion rate. 38. What happens after the trial? One of the most important aspects of optimizing your landing page for users that will stick with you after a trial period is to transparently communicate what is going to happen after the trial ends. Will their credit cards be charged automatically? If they haven’t given you their credit card number, then what is going to happen after the trial? Will all the data they got when using the tool still be there? Providing information like this is extremely important to keep users way after their trial. It’s important to give your new users as much clarity as you can as you want them to stick with you afterward. So your landing page should be already describing these details. Especially when you’re going to charge their credit card after the 30 days end. It’s just a sign of transparency that will help you get a better connection with your new customer. Here’s an example of UserEngage – they show you that you don’t have to supply a Creditcard when you sign up. This makes it clear that you don’t automatically get billed after the trial is over. 39. Are there surprising costs? Most websites do this really well, yet sometimes I still find a website that has a terrible way of communicating extra costs. This is more common in the e-commerce world but even in the regular business world it seems sometimes businesses just forget. It’s terrible for the user experience if you do not provide clarity about all the costs that your users are going to be charged for beforehand. You can’t tell them something is going to cost $200 and then add $20 to the first invoice as ‘administration costs’. Not just that, research shows that 56% of the people that abandon an online purchase do this because of unexpected costs. You can read more about that in this article. Some companies somehow still get away with this and, in my opinion, it’s a terrible business practice. You want your customers to trust you and there’s no better way to lose trust than to not be open about the costs. Again, if you want to make sure you get lifetime users for your business, you must make sure all costs are clearly stated. The landing page is a great place to do this. Even if there are setup costs, make sure you just communicate it and mention it on the pricing page. 40. With or without taxes? Another way to make sure you are extremely clear about everything the user needs to know is by showing them whether your prices are including taxes. When you operate globally, this doesn’t always make sense but it is important to at least show which users from specific countries will have VAT added to their invoice. This has a big impact on the pricing of the service. For example, in The Netherlands, the normal tax rate is 21%. So a product of $100 without taxes is now $121. This should always be specified before people sign up. Extra costs are always going to be noticed by new users and it can be a good reason for them to just go to a competitor because they now find the price to be too high. Along with that, a lot more support tickets will be opened if you are not completely transparent about the pricing before people sign up. It’s important to specify what kind of contact options people have when they sign up for your product or service. Can they get support by phone, live chat or email? Many businesses nowadays provide a live chat option and it’s great to see that this group is getting bigger and bigger. In-app customer service is already being used by a lot of different companies. Though you can’t always provide live chat to all your users, it’s still good to tell them how they can reach you. Phone support seems to be dying in the last few years while email is still one of the most used options. Social media support is also getting a lot bigger in the last few years. Though response times on these media can still be high, lots of people still appreciate that a company responds within several hours. When users sign up, make it clear what kind of options they have to get support or to contact you. By doing so, it is a lot easier to make sure you are truly getting the right users. You should also clearly state how long it will take on average to get support through these contact options. If you take an entire day to respond to emails, just be open about it. If you respond to social media within 30 minutes, mention that as well. By specifying what kind of contact options people have on your website, you are opening the doors to the right type of signups and conversions. Clarity comes from visual elements and through text. One of the most important aspects of text is making sure you are really speaking to your audience. Are you telling your audience what they want to hear? If your product isn’t clear in your wording, you will get the wrong people to your product or service. It’s great to have a lot of signups or conversions but having useless signups and conversions is only going to cost you money. The elements on your landing page should be clear to your visitors. They should speak to them in a way that resonates with them. Are you truly speaking their language or are you using words that they don’t understand? As mentioned before in this article, it’s important to realize that if you run a product or service that is being sold globally, you might want to refrain from using hard words that aren’t well known internationally. By doing so, you provide better clarity to your international users. In the next section, I cover this a bit more. Inside jokes are great! (For your company). But not for the people that visit your website. If visitors don’t get the joke, your whole proposition is lost on them. Which will definitely decrease the conversion rate on the landing page. A line of text, headline or product description should be great from the first letter to the last letter. It’s alright to use jokes or puns on your landing page, just make sure these are jokes and puns that everybody understands. Puns aren’t always well known abroad so if you sell your product or service across the border then you want to check again whether this is actually a good idea (and let’s be real, you probably think the pun is funnier than everybody else). The same goes for jargon. I believe Apple is a great example of this and I’m sure you’ve heard this story many times but I’d like to include it in this section as well. Technical aspects don’t say much to people unless they are truly invested in that type of technology. This is what Apple really understood when they introduced the iPod. All their competitors were talking about ‘MP3 players with 32MB space’. Now, I was just a kid when the iPod came out – though a bit of a savvy kid. So, knowing how much an MP3 file was, I could understand that 32MB allows for X number of songs of my favorite childhood bands. But most people back then weren’t too savvy, especially older people. So Apple decided to do it differently, as they’re well known for. Instead of telling people how much space was available on the iPod, they just told people how many songs they could load onto the iPod. This is way easier for people to understand. Going back to landing pages: this is exactly what you should do as well. It is important that you stay away from the jargon and instead you should mainly focus on the problem that you are solving for your users. Don’t try to overcomplicate the solution for them. 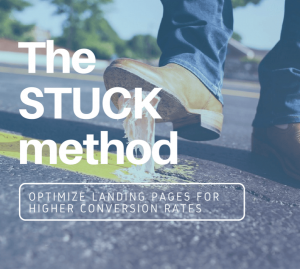 People that visit your landing page want a solution to a problem they are currently facing. So make sure you are using the right words to tell them that your product or service is the right solution. Being clear about the product or service you provide is key to getting lots of signups and conversions – and these aren’t your useless signups and conversion, they’re your preferred signups and conversions. What’s the first thing you see when you load a website? It’s called ‘Above the fold’. This is the part of the website that you see on the screen without scrolling down. And providing clarity to a user starts right there. When you visit your own landing page, what are the first few elements you see? Are you actually giving people a reason to scroll down and read more? Are you showing them what step they should take next? Clarity is essential above the fold as it highly influences which step the user will take next. If it’s not clear what your product or service does without having to scroll down the page, you will have a lower conversion rate. You want people to relate to your message, to make them enthused about the product or service you are providing. They’re not going to be excited if they can’t find much information on the first screen they see. Also make sure that if you have a landing page where users can scroll down, to mention that they can scroll down. By adding a ‘check it out’ or ‘read more below’ element above the fold, you make it clear that there’s more on the page for your visitors to read. 45. How does your product work? Another way to provide more clarity about your product or service is by describing how it works. This shouldn’t be too hard and is especially valuable when you are selling a product or service that is new to the market or industry. By describing what makes your product or service so unique, how it stands out from your competitors or from what people have ever experienced before, you will provide them with valuable information. If you sell data on companies, make sure you tell your visitors how you gather that data. If you’ve built a great sales tool, tell users why it’s so great. Tell them what makes it different from anything else out there. You don’t have to go into specific details, just make sure you are at least transparent about how your product or service is made. If you sell diamonds, people most likely want to know where these diamonds came from. Providing this sense of clarity is extremely important when it comes to getting new signups and conversions. If your product is extremely cheap, people should know why it’s so cheap. What makes the process of making it cheaper than what your competitors are doing? 46. How will they be billed? Billing, as a company you are most likely billing your customers once they get a paid plan or buy a product. And that’s good, you need to make money after all. It’s important to tell your visitors how you are going to bill them and when you are going to bill them. Are they going to be paying monthly or yearly? Are they going to be billed using Paypal or credit card? By being clear about the billing before people sign up, you have fewer signups that aren’t worth the time and effort in the first place. If you don’t provide Paypal but people want to pay with Paypal, you’re going to have a bad time after they submitted the form. Providing clarity on billing is extremely easy and can be added to your landing page in seconds. 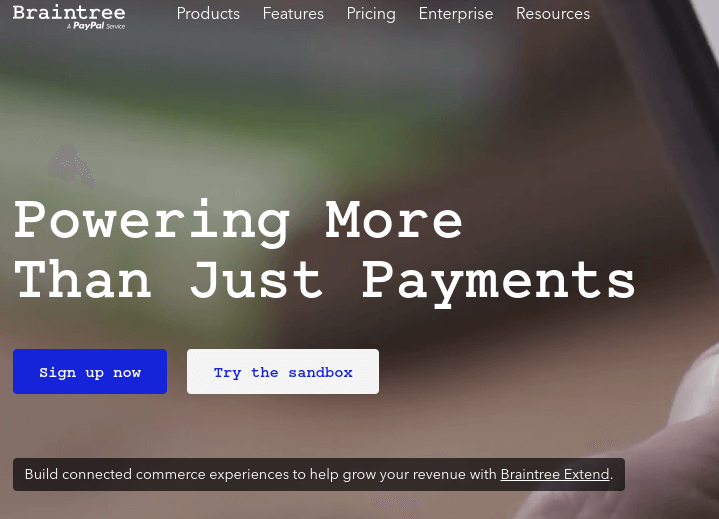 It might – potentially – lower your conversion rate just a bit because some users don’t want to pay by credit card and you only accept credit card. But those new signups were going to drop out eventually anyway. Just adding images of payment methods is already a great way of making sure people are aware of this. If you require a credit card for the trial, it’s already clear to them as well that credit card is the preferred payment method. Add a short line of text about the payment methods if you want to decrease the loading speed and don’t want to add images. Just know that using symbols will make it a lot easier for your visitors to recognize the payment methods. When you have a landing page that asks for people’s phone numbers because you’re going to call them back, make sure to add to the form when you will call them back. If they are registering for an event, make sure you mention that they will get their ticket right away after they are done purchasing. 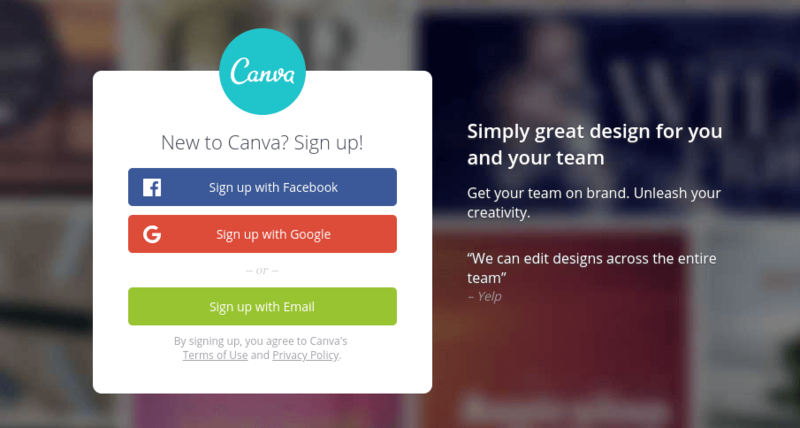 If they sign up for a SaaS tool, add that they will be taken to the tool right after signing up. This may seem like a no-brainer, yet many landing pages are still missing this important element of clarity on the page. It’s another element that just takes a few seconds to add but it provides a lot more clarity to the user. You can either mention this in the call-to-action button or in the space you have left below the button. You can even mention it in the form itself. 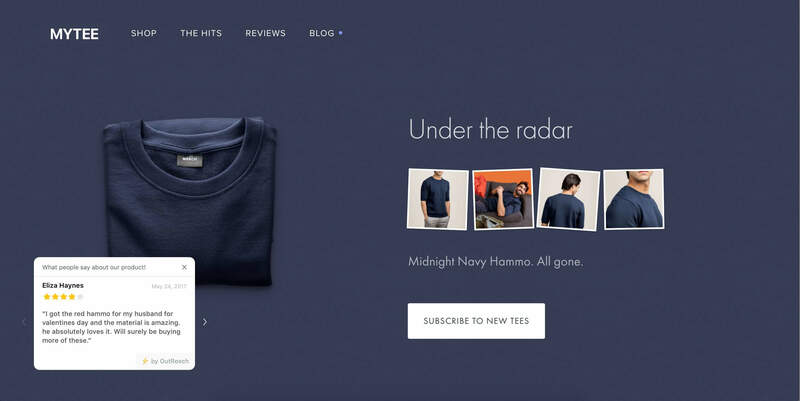 It’s just a small line and it will do wonders for how visitors perceive this landing page. It also adds to the fact that people are willing to send in the form. If it takes 7 days for you to call back, many people will not convert. If you call back right away, you will see the conversion skyrocket if you get the right traffic on the page. Elements like these are very simple and provide a better experience for your visitors. Don’t underestimate these as they are necessary for your visitors as they want to know what they can expect from providing their data. None, just make sure you paint the picture correctly for your users. Alright, ‘sense of urgency’ kind of made a rebirth when the internet happened. About 10 years ago, websites with this sense of urgency were created by the hundreds. I am sure we all encountered a landing page selling some strange belly fat burner, with a big timer ticking away telling you that you only have 15 minutes left. Now, to you and me, it’s highly obvious that these were the scammiest things around. Yet, people still fall for it (shout out to that Nigerian Prince that keeps emailing me to give me $100 million if I send him $2000 first). I am not saying you should add one of the scammy timers to your landing page as well. But when you are hosting an event and setting up a landing page for it, it does make sense to at least show people how long they have left before signups close. Creating a sense of urgency works. People hate missing out. FOMO (Fear Of Missing Out) is one of the most famous persuasion tactics out there. And it’s simply famous for the fact that it actually works. But you should only create a sense of urgency when it actually makes sense. Are you raising the prices of your product or service in 7 days? Then it might be worth it to add a countdown timer to your landing page. When it comes to the landing page and improving clarity, it is also important to clearly identify the different parts of the page. This means that every important part of the page should have a clear headline telling visitors what this part of the page is. Let’s say you’ve added some client logos and media where you were featured on the landing page. If you don’t tell users what these logos mean, they will have a hard time understanding them. If you mention Forbes and New York Times but don’t tell people you were published in them, they either look like they’re clients of yours, you were published on these media platforms or you just randomly added some logos to the page. By providing clarity in each section of the page, it will be a lot easier for visitors to understand what you are trying to tell them. The same applies to your signup form. Make sure people realize it’s a form. Sure, the text fields are an indication but maybe it’s an opt-in for your newsletter and not the signup form for your product or service. Make it easy to understand what visitors can do on that specific part of the page. If you added case studies to the landing page, add a ‘How other people/companies use our product/service’ title to that part of the page. If you talk about features, mention that these are features. Same goes for testimonials, videos you added to the page or even links to whitepapers or blogs. Everything should be clear on the page, every element should be understood. So you got yourself a beautiful looking landing page. And you put a lot of time into making sure a lot of traffic hits the landing page. But you forgot a few important aspects, such as making sure the colors and fonts actually look good together. There’s this famous story of a big Dutch bank (and I’m sorry I don’t have screenshots of this) that spent tens of thousands of euros on having their new landing pages built. And to be honest, they weren’t exactly worth the money. Because not only was the background very transparent and mostly filled with white colors, the main headline of the page was white as well. Meaning that nobody could actually read what was being described on the page. As you can imagine, this had a huge impact on their conversion rates. You don’t even have to research that. The main proposition on the page wasn’t visible, and it was costing them a lot of money. Now, after two weeks, I believe they finally realized their mistake and changed it to a less transparent background with no white elements. But in the meantime, they had already spent a lot of money on TV ads, billboards, and online ads. It’s important to make sure the colors and fonts on your landing page are easy to read and that you can distinguish text from the background. Some fonts work great on landing pages, some don’t (obviously, Comic Sans should never be used – unless you’re launching a 90s theme party). “Chaos breeds geniuses”, I once read. This may be true, but chaos definitely doesn’t breed signups and conversions. Instead, chaos has a huge impact on your landing page. If every important element is in a random spot on the page, you can’t expect to see a lot of conversions. Instead, make sure your page is beautifully designed. Actually spend some time to make it beautiful. To make it look minimalist if it must look minimalist or full when it needs to be full. But at least make sure it makes sense. There’s no clarity in chaos (and I am sure you already knew that). There’s clarity in making sure the landing page makes sense. That elements are right where they need to be. I can’t stretch this enough: please avoid chaos on the page. Don’t make visitors look for information but simply provide it. Don’t make it hard to find the FAQ or a page with more information, just provide it. The more time visitors need to understand your product, pricing, event or anything you want them to sign up for, the more time you allow them to just be sick and tired of it and leave your landing page. 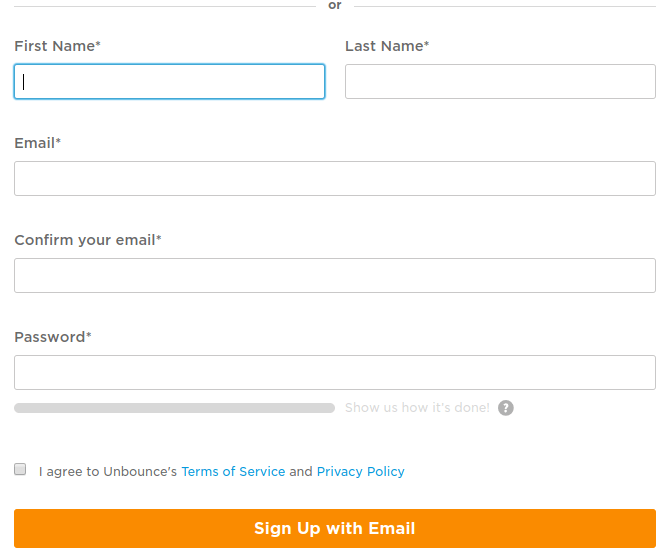 Don’t add the signup form all the way at the bottom, for example. If people want to sign up, it makes no sense they have to scroll down all the way. Make the signup form clearly visible at the top of the page – if people want to sign up they’ve seen it by now (and just add buttons to the signup form across the page). Visual elements are a great way to increase the conversion rate on your landing page – if you use them right. They can either make or break your landing page – literally. Let’s take dentists for example. It’d make more sense to show pictures of happy people with white smiles than to show awful pictures of a dentist who is about to put a drill in some patient’s mouth. The first one creates happiness (people in the picture are happy, so you get happy as well). The second one creates a sense of fear (because we all know the terrible sound of that drilling). So a dentist would definitely see lower conversion rates on a landing page using the second picture rather than the first. And it’s the same for any company. By providing the right images, you help your customers make better decisions and feel better. If you sell a product or service for parents to help their kids with school, don’t just show happy kids running around on a playground. Show them an image of parents walking with their kid, smiling ear to ear. Campaign Monitor does a great job on their main landing page, showing two people smiling (while using the software). They also look at the call to action button. Research shows we are often looking in the direction others look at as well, and this even works with images on your landing pages. People need to recognize themselves in order to feel a better connection with your landing page, ultimately leading to feeling a better connection with your product or service. Provide great images and you provide a better clarity on your landing page. Don’t underestimate the value of great images – they will do great things for your conversion rate. If you sell an online service or product, such as software, it truly helps to give more clarity to users. You can easily do this by adding images of the dashboard, showing them it’s very easy to use, give a great overview and only takes a few minutes to understand. Many software businesses already do this, yet I still occasionally visit a landing page that doesn’t completely do this. And that’s too bad since it’s a great opportunity to make sure you’re really showing the best information to visitors. You can significantly improve the conversion rate of your landing page if you show your visitors that the software is very easy to use and looks great. They don’t have to sign up before seeing that, leading to a better sign up to paid customer ratio. After all, if these users don’t like the interface, they will probably not sign up anyway – which is great for you as you don’t need to dedicate time and money to try to convince people to buy your product when they weren’t going to buy it in the first place. 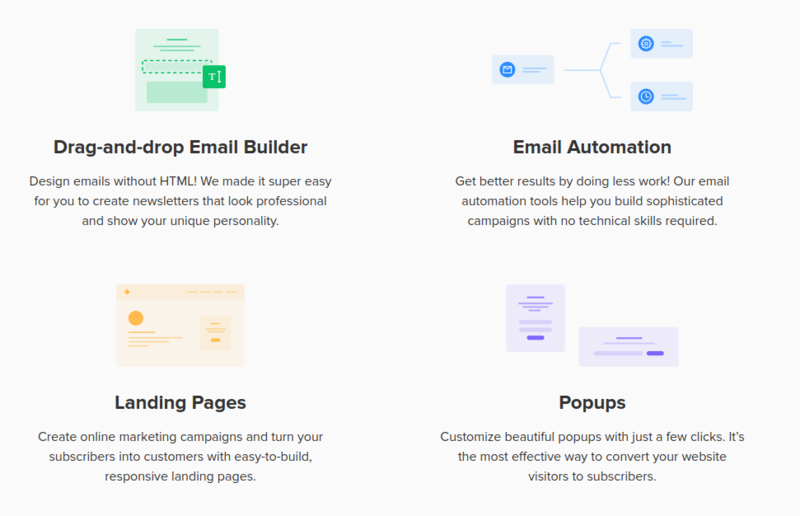 None, look at examples of other landing pages for SaaS companies and make sure to include a screenshot of your dashboard on your landing page. Features and benefits, that’s where it’s at for your landing page. As mentioned before, it’s important to use text to give a clear overview of what your product does. So you should spend a lot of time writing about the important features and benefits of the product or service rather than writing about the technological aspects of the product. There are most likely many features and benefits of your product or service that you can describe, so it’s definitely worth it to take some time to explain these on the landing page. They can have a huge impact on your conversion rates and will definitely provide more clarity to visitors to understand whether this is a great product or service that they need right now (or in the future, meaning they will hopefully come back through one of your advertising campaigns). To add on to this, it’s important to address the biggest pain point on your landing pages as well. What is the number one problem your visitors are facing, and how does your product or service provide a solution for that? Dropbox did it with file sharing. Booking.com did it with providing the best prices for hotels. Uber did it by providing a faster way to get a ride. By addressing the biggest pain point, you emphasize your biggest Unique Selling Point. And by doing so, it will be a lot easier for visitors to understand why they really need your product or service. We all have problems. Some are significant, others are not. But we’re always trying to look for solutions to these problems. And if you have a product or service that helps people to solve it right now or in the short term, your visitors will more likely sign up for it. Last but not least. This is another essential element of providing clarity on your landing page: making sure that users can only take one specific action. This means that your landing page should be designed around that action. They need to be able to do nothing else but take that action. Don’t add a form for email opt-in, a form for your next webinar or event, a form for a coupon and a form to sign up for your product all on the same page. People will stress out when they have too many choices. Imagine walking around in the supermarket, looking for shampoo. Nowadays we have 30 different choices, yet we only need one bottle of shampoo. This goes along with the concept of creating less chaos on the page: make sure that users simply have one action on the page and design everything on the page to make sure they will take that action. By removing all other distractions, all other actions that users might take, you instantly increase the conversion rate and will no longer confuse visitors on what to do. Alright, so it’s time for the last part of the list: the K. Which stands for KPI’s; Key Performance Indicators. We all track metrics. And it makes sense, we want to make sure we are doing better. Today should be a better day than yesterday. And tomorrow should be a better day than today. This is a short chapter but it’s important nonetheless. By tracking KPI’s, you are setting yourself up for better results and higher conversion rates – which means more users and more paying customers. First step to KPI’s is knowing what to track. In this case, it’s conversions. Why conversions? Well, it’s great that you are getting 10% more visitors a month but if none of these new visitors sign up, you don’t get much out of it. So, instead, you focus on making sure that you are actually tracking the right element: conversions. Because this also means you can figure out if your conversion rate is actually improving when you make changes to your web pages. Now, in order to do so, you need to make sure that you have optimized several essential elements. These elements will be covered below. As a UX Designer or data analyst, you need to make sure you have the right focus on KPI’s. These KPI’s will also be the one metric you are tracking through optimizing software such as Optimizely, Google Optimize or Visual Website Optimizer. UTM-tags are essential when you are trying to optimize your conversion rates. These tags help you segment specific types of traffic. By using segmentation, you can find out whether your conversion rate is actually going up. These UTM-tags are very easy to add to your links and it’s important to, when you are launching any ad campaign, add these to the URLs that you are using for these campaigns. By segmenting the traffic, you can easily find out which types of marketing campaigns perform well and which don’t. If you get a lot of traffic through Google’s organic results, but the conversion rate is low, it might hurt your overall KPI’s if you do not segment the traffic. It could be that your average conversion rate goes up from your newsletter and Facebook ads but because your organic visitors do not convert, it might not result in any improvements to your conversion rate. If you use software like Google Analytics, you need to use UTM-tags. This also goes for using optimization software, as these platforms also allow you to easily segment your traffic based on these UTM-tags. Over time, you can easily see whether your conversion rate is actually going up and which marketing campaigns made sure the conversion rate improved. Which brings us to the next factor: making sure your software is actually set up correctly in order to get the right results. See, if you don’t have your goals set up correctly, you will never know whether the improvements you are making are actually giving you better results. Which means that making these improvements is actually a waste of time. And wasting time is the last thing you want to do when you optimize your website. If you have already set goals in Google Analytics, the first thing you want to do is checking whether these goals are set up correctly. You can do this by going to Google Analytics > Admin > Goals > Click a specific goal > Check for conversions over the last 14 days. If you haven’t set any goals in Google Analytics, this is the moment to do so. You want to set these goals before you make any improvements to your web pages. Why? Because if you don’t set them up right now, you will never know whether you will actually get higher conversion rates when you optimize your website. Below, you can find several additional resources that will help you set up these goals correctly. Always make sure you do this, it will be so much easier to optimize your web pages if the goals are set properly in your analytics software. Last but not least: make sure you pick the right software. Within the world of Conversion Rate Optimization, there are several tools you can use to start optimizing your website. Google Optimize is a great free tool that integrates with Google Analytics perfectly. Which is why it’s highly valuable if you want to start optimizing your websites. It gives you the basic elements that you need to start optimizing your web pages and will help you optimize the most basic elements such as the call to action text and colors. And then there’s Optimizely, most likely the most well-known tool within this space. It gives you a ton of possibilities to optimize your web pages and has a great analytics back-end that will give you the right insights to optimize your web pages. Optimizely is the biggest in this space. It also provides a great API which allows you to connect it to KPI Dashboards. These types of software all help you to bring a perfect optimization strategy to the web pages. One of the best features of optimization software is giving you a score based on the number of visitors and conversions. Basically, the software tells you whether you had enough visitors to guarantee that version A or B is better. Which will ultimately result in better optimization results, as you won’t make any changes of which you aren’t certain that they will bring the results you are aiming for. Every day we wake up knowing we can help companies grow while doing what we love. We work with companies that like to think differently and are always keen to find new ways to improve what they are already doing. Want to talk to us? Feel free to call us at +3185 06 06 789. If we don’t pick up right away, we’re probably obsessed with analyzing the results from our new optimization experiments. Don’t worry, we’ll call you back.